CanadaGenealogy, or, 'Jane's Your Aunt': RootsTech 2014 - First Day! RootsTech 2014 - First Day! Just a quick note this morning. Lots of excitement as today is the first day of RootsTech 2014! I'm leaving soon as we geneabloggers will have a sneak peak at the Expo Hall before the official opening. The Expo Hall is big! And full of exhibitors with products from cloud services to software to genealogy databaxes and sites, even books! 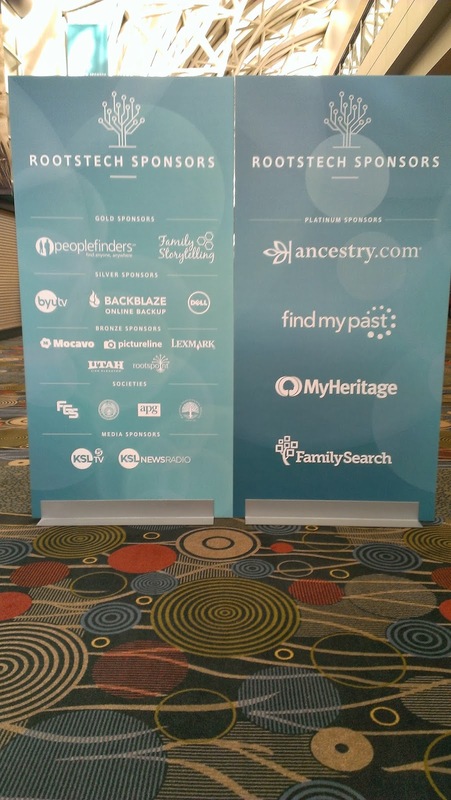 FamilySearch will be there, of course, and Ancestry.com, Find My Past and My Heritage, but there are many smaller companies too, including the finalists for the Developer's Challenge. FamilySearch will be featuring the new Indexing programme and giving all a look at the new software that's coming. And for FamilySearch, this is the Year of the Obituary and so on and off today a special person, the pirate Captain Jack Starling, will be promoting obituary indexing. Obituaries are treasure troves to genealogists, after all! Almost ready - let's see: phone, portable charger, name tags, my postcards to hand out, lunch ticket, water bottle, purple blogger beads! Yes, I'm good to go!